Gracias, Sr. Gabriel. Leeré atentamente lo que me manda. Ahora le mando yo una copia del artículo del blog "FIDES ET RATIO". Dígame si le parece serio. Dios lo bendiga. 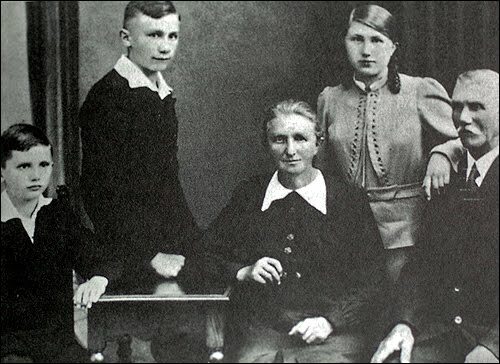 Del blog "FIDES ET RATIO"
Pope John Paul II's mother was of Litvak Jewish ancestry and Pope Benedict XVI's grandmother Maria Tauber-Peintner of Bolzano, Italy (then part of the Austro-Hungarian Empire) may have also been of Jewish ancestry from the Jewish Tauber family of Moravia and Hungary descended from Aaron Tauber of Moravia. It would seem that her mother Elisabeth Maria (Betty) Tauber (b.1834 Moravia) was born a Moravian Jewess who was cut off from her family when she became a Catholic. Moravia and Hungary were regions of the Habsburg ruled Austro-Hungarian Empire until World War 1. Betty moved to the South Tyrol area of the Austro-Hungarian Empire (now part of Italy) where she had a daughter with Anton Peintner. Anton didn't marry her until about 3 years after the birth of their daughter Maria in Rasa in 1855. Betty was the daughter of Jacob Tauber (b.1811 d.1845)and Josefina (Peppi /Josefa) Knopfelmacher (b.1819 d.1886). Jacob Tauber was the son of Jonas Tauber and his wife Rebekah Zerkowitz. The Zerkowitz family claimed Kohen status. Pope Benedict XVI is thus a descendant of the Maharal. (8) Sarl [Sarah] Shpitz (b. 1703), m. Rabbi Jacob Knoepflmacher (c.1700-before 1739), "the master", "chief rabbi in Mehrin"
Aaron Tauber may have come from the Jewish community of the Tauber Valley in Bavaria from which he received his surname. He later moved to Moravia. The emblem of the Tauber family is the Dove connected to the name Jonas or Jonah. Aaron's father was Jonas of the Tauber who was a descendant of Rabbi Jonah Gerondi. It would seem that the Tauber ancestors took Catholic identity and names during the persecution of the Bavarian Jews and later openly reverted to Judaism in Moravia. Very informative, thnaks for sharing. Does this mean gefilte fish on Fridays from now on?? I strongly recommend that you check your sources. No self respecting Jew would call his daughter "Maria" or "Betty" or "Elizabeth". Those are and were Christian names. I think that if the Pope had Jewish blood I doubt he would be the Pope. You might want to check with your local Chabad and they will be more than happy to confirm the above. Sorry but there goes another possible Revelation prophecy. Well that shows how much you know about Jews. I know plenty of Jewish people who are called Elizabeth, Maria and Mary. In this case however Elisabeth Maria is the name she took at baptism, she was called Betty by her Jewish family before her conversion. In fact there are a number of Betty's and Maria's in the Tauber Jewish genealogy descended from the Moravian Jew Aaron Tauber. Many Jewish people have an ordinary name as well as a Hebrew name. For example I have a very good Jewish friend called Eric whose Hebrew name is Moshe. I suggest you do your research before you pontificate about what names Jews may or may not have. You might have noticed that she was called Betty after her Jewish grandmother Betty Knopfelmacher. Betty had a older half brother called Jonas Tauber (b.1832) and 8 younger siblings called Markus, Katharina, Justina, Michael,Julia, Sali, Fanni and Helena Tauber. Excuse me for my bad English, I hope that you can understand me. 1. The ancestors of Benedict XVI. on mother's side in South Tyrol/Italy can be verified up to the year 1667. "Moravia" ist nowhere mentioned. 2. The church historian has nowhere found the name "Knopfelmacher" in the family tree on mother´s side. I ask you to remove this nonsensical family tree on your web site, also therefore, because this familiy tree is used by anti-Semites. I will be quite happy to remove this post if you provide the names and birth records of Elisabeth Maria Tauber and her parents. Who are her parents according to your friend? Still no answer from Paul about who his church historian says Betty Tauber's parents are? Seemed so keen to convince me that the Taubers were not Jewish but provides no names or details at all. Córdoba de la Nueva Andalucía, 11 de mayo del Año del Señor del 2011. SANTOS FELIPE y SANTIAGO EL MENOR, APÓSTELES. Sopla el pampero. ¡VIVA LA PATRIA! ¡LAUS DEO TRINITARIO! ¡VIVA HISPANOAMÉRICA! AVE MARÍA PURÍSIMA!